To survive disruption and thrive in the digital era, incumbents need to become digital enterprises, rethinking every element of their business. One of the defining characteristics of the digital revolution is the plummeting cost of advanced technologies (a drone cost $100,000 in 2007; a similar model $700 in 2013). Cheaper and better technology is creating a more connected world: today, there are 8 billion devices connected to the Internet; by 2030 it is forecast that there will be 1 trillion. And the ‘combinatorial’ effects of technologies, such as mobile, cloud, sensors, analytics and the Internet of Things, are accelerating progress exponentially. The astonishing pace of technological advances is making it difficult to clearly understand digitalization and fully grasp its implications. Consequently, a number of influential myths have sprung up. A common perception is that digital disruption is bankrupting incumbents and that there is no way back for them in the digital economy. Another myth we encountered is that digital is just a back-office issue focused on achieving operational efficiencies. A third misconception is the belief that companies can implement a successful digital transformation simply by launching a digital business unit and hiring a Chief Digital Officer. These myths need to be debunked before an effective strategy for digitalization can be developed. In this series of articles, we reveal the reality behind these myths and chart the true impact of digital transformation and its implications for incumbents. Busting these myths leads us to an important point: incumbents will need to transform themselves into digital enterprises to thrive, and this transformation will need to be far more profound than merely investing in the latest digital technologies. Companies will need to search for new business models, fundamentally rethink their operating models, revamp how they attract and foster digital talent, and consider afresh how they measure the success of their business. 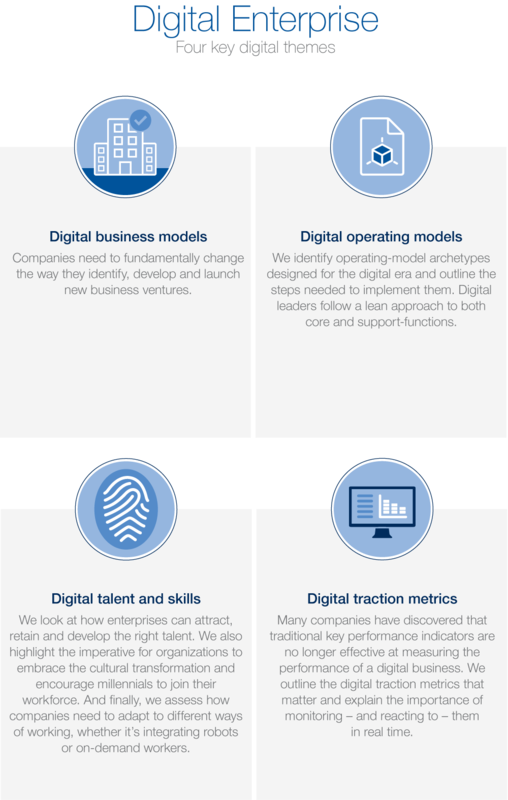 We focus on four themes – digital business models, digital operating models, digital talent and skills, and digital talent metrics. Analog incumbents (which we define as large successful enterprises that predate the digital revolution) can face formidable challenges in implementing changes in these areas. The innovator’s dilemma can thwart efforts to seek out new revenue sources and implementing innovative business models is a complex endeavor. Creating an agile, asset-light digital operating model can be rendered more difficult by a risk-averse corporate culture and a strategy more suited to five-year planning cycles than an iterative, fail-fast approach to innovation. Acute skill shortages are making finding the right talent challenging, with 72% of CEOs struggling to source the right digital talent. To help incumbents overcome these challenges, we have drawn up a set of key actions for CEOs. Our recommendations are supported by a set of key questions to aid industry leaders in their analysis of some essential digital transformation themes, including how to launch new business models, set up a successful corporate venturing business, understand and leverage data, build a high-quotient digital workforce, and convince the investor community about the digital transformation journey.